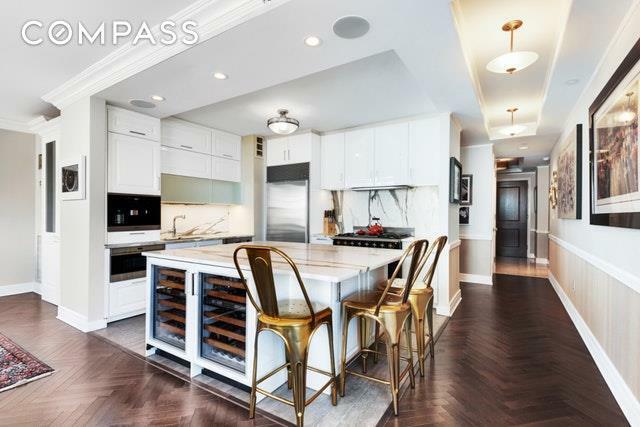 Are you searching for a 3BR Condo in Lower Manhattan that offers great views, an amazing kitchen, and a prime location? Or an oversized 2BR with a grand-scale living area?The sellers have completely reconfigured the layout here from the original oversized 2BR, creating the current, super-functional 3BR plan. However, returning it to a grand 2BR can be negotiated as well. 34C is unlike any other apartment in South Battery Park City, offering a classic-contemporary aesthetic that you must experience in person. A large formal entry foyer greets you, with abundant room for a console table and also plenty of wall space for art. Follow the gallery into the main living area, where the original kitchen, living room and dining room have been reconstructed to create a Great Room with an open loft-like feel. 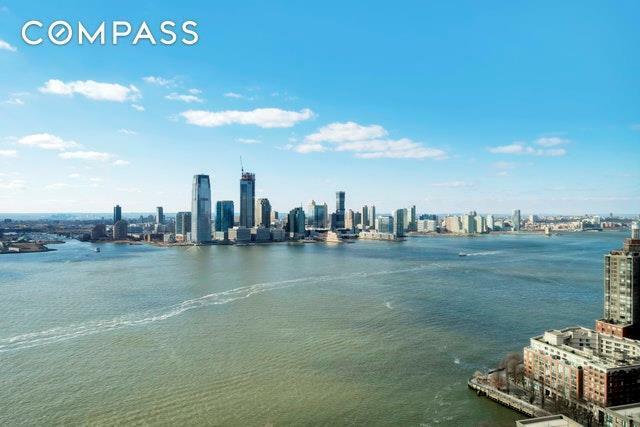 You are surrounded on three sides by views of the Hudson River and Wagner Park to the west, the World Trade Center complex to the north, with the Empire State Building and Midtown skyline in the distance. The east side of the room overlooks Battery Park, Governor's Island and a slice of the NY Harbor. Each individual window offers an automated privacy shade which is controlled by a Crestron system, which also automates the unit's sound (music and TV) from concealed, recessed speakers. Underfoot are new hardwood floors in a herringbone pattern. With its current, 3BR plan, the Great Room has defined dining, living, and home office areas. This space would become even larger if the home were converted back to its original layout. The heart of the kitchen is a La Crange stove which is both beautiful and a highly precise tool for the most discerning chef. The pale Calacatta marble island top spans 4'11" by 6'3" which includes an overhang that allows room for stools. Built within this island are two subzero wine refrigerators and ample storage: cabinets and drawers. 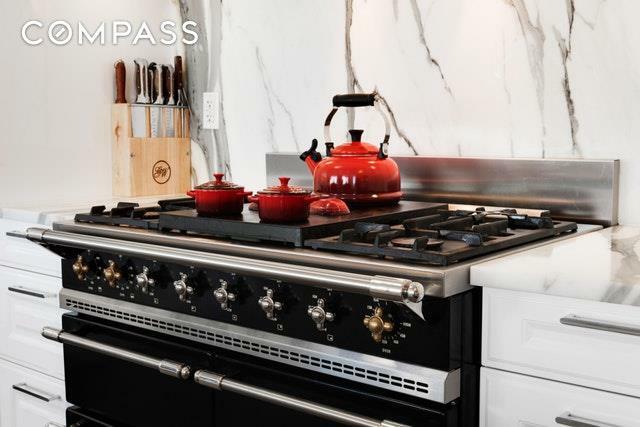 The white lacquered cabinetry is designed by Poggen Pohl including a few which have automatic opening features; the backsplash and countertops match the marble island.The Sub Zero Refrigerator/freezer is clad in stainless steel, as is the Wolf microwave. Are you a coffee drinker? Preparing hot beverages will be a pleasure with one tap of the finger on this built-in Miele Coffee drink station. The master bedroom is on the north wing of the apartment, while the other bedrooms are across the hall on the east. 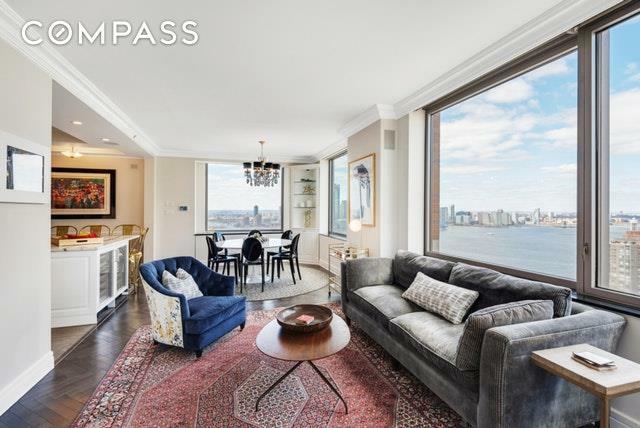 One entire wall is tall windows overlooking the Hudson River. Each individual window is outfitted with both an automated black-out shade and a privacy shade. All of the original closets have been updated by "California Closets" and an elegant wardrobe has been seamlessly built into a recessed alcove. All bedrooms have Brazilian cherrywood floors. The generously sized master bath is finished in a creamy marble and features a double sink, deep Kohler soaking tub, separate glass shower with an updated handheld fixture.The second and third bedrooms function as a separate wing with a shared marble bathroom and oversized dressing and play area. The large windows face east and offer open views and great morning light; each of these windows also has motorized black-out shades.The condo amenities include white-glove service, 24-hour doorman, concierge, security, valet parking, a restaurant, lounge and bar, and a bright, windowed gym. Room and maid service courtesy of the Wagner Hotel, in the building, are also available to residents. Call, text or email us to schedule your private tour. Listing courtesy of Terry Lautin of Compass.